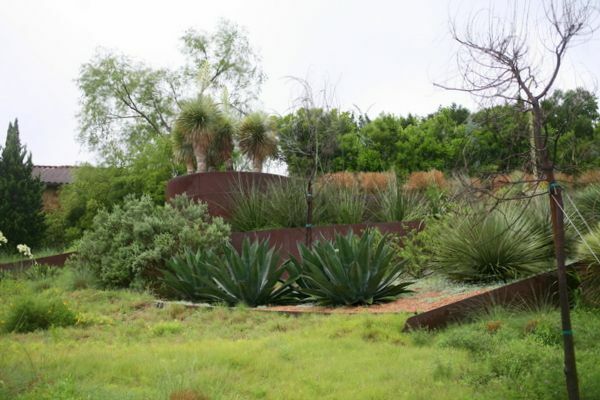 Heroic in scale, the agaves and Cor-Ten steel undulating walls wet with rain, topped by a grove of Yucca rostrata at the rear entrance to the property. To say this house and garden have a lot of angles is an understatement on so many levels besides just the literal. 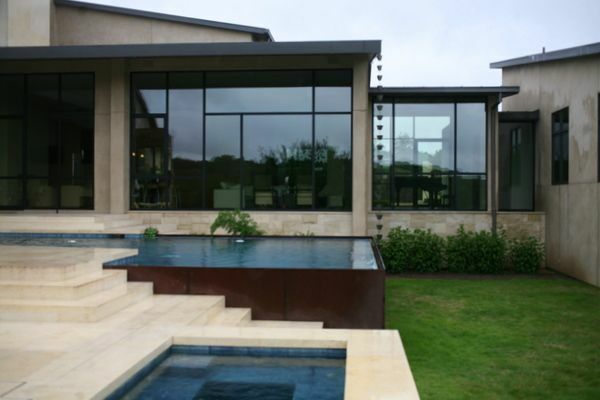 Because of that interplay of the house and landscape architecture, it’s one of those projects that makes you wish the architect and landscape architect were available in a panel discussion to talk about how they fit all these disparate puzzle pieces together to accomplish such a unified vision. 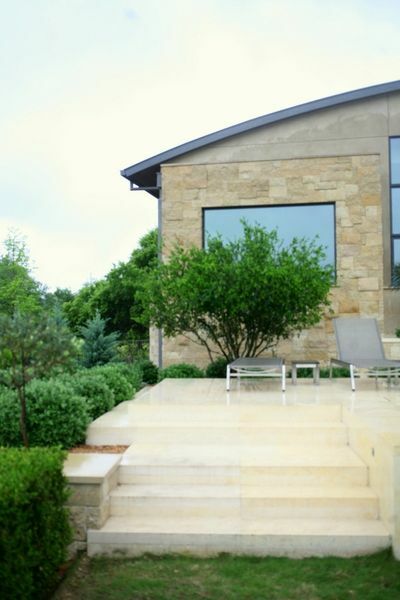 I knew the fabulous landscape architecture was done by Curt Arnette but didn’t know who built the house. 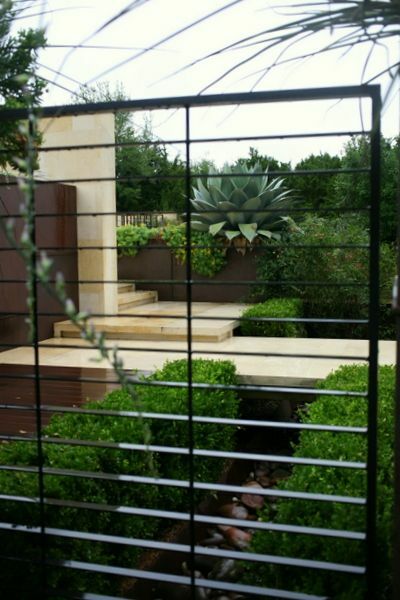 A peek into the courtyard behind the massive Cor-Ten planters also serving as walls. 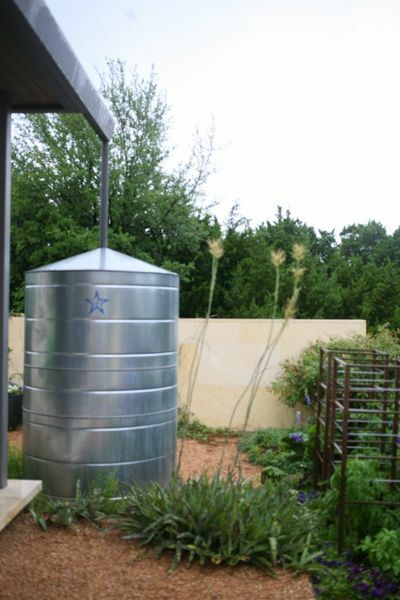 Raining off and on, I didn’t grab many photos of the veg garden just beyond the courtyard, which along with this cool, Lone-Star emblazoned cistern had a spectacular board-formed concrete water feature. Some of the photos were too rain-blurred to be useful. Like I said, there were a lot of angles, a lot of facets to this complex property that somehow folds itself seamlessly into the oak-dotted landscape. What I’ve captured in photos is a tiny slice of the whole, including the back entrance leading to an inner pergola, terraces, patios, lawn, and pool off the back of the house. Photographically, balancing the interplay of all those angles is a fascinating challenge, which makes the work of the masters of architectural photography like Julius Shulman that much more impressive. I had to straighten quite a few of these photos! We did not enter here but headed to the terraces, pool, and patios off the back of the house by heading left of that curved retaining wall. 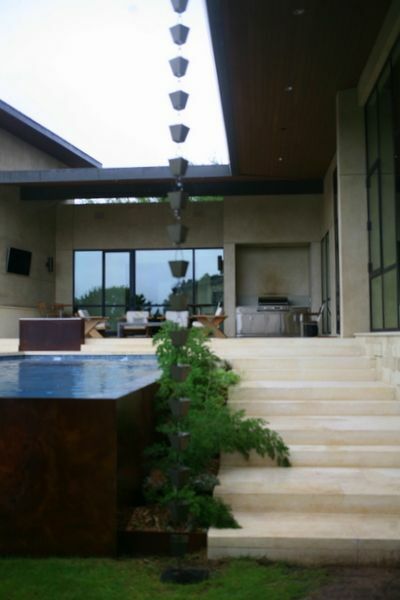 Leading to a fig-draped pergola and the pool area beyond. 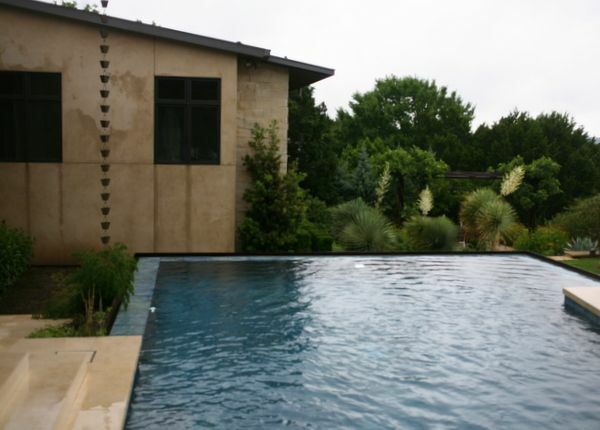 From the pergola, then across the lawn to the pool and terraces. Looking from the limestone terraces off the house in the direction of the pergola. 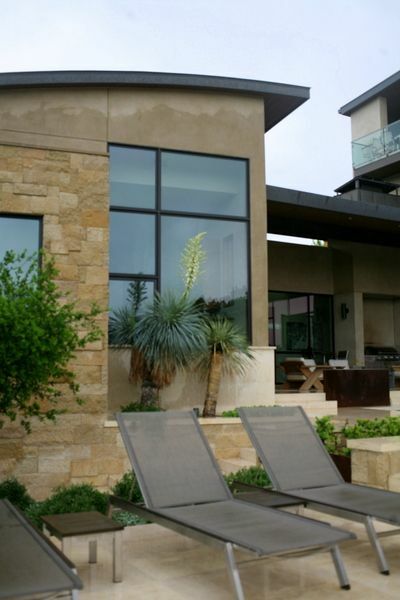 Just visible beyond the lounge chairs is the deep overhang sheltering the sitting area closest to the house. Summer in Austin means days on end over 100F. 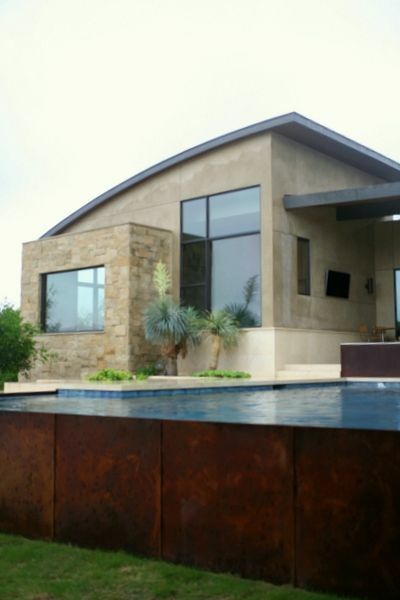 A limestone soaking tub is a few steps away from the Cor-Ten-enclosed pool. 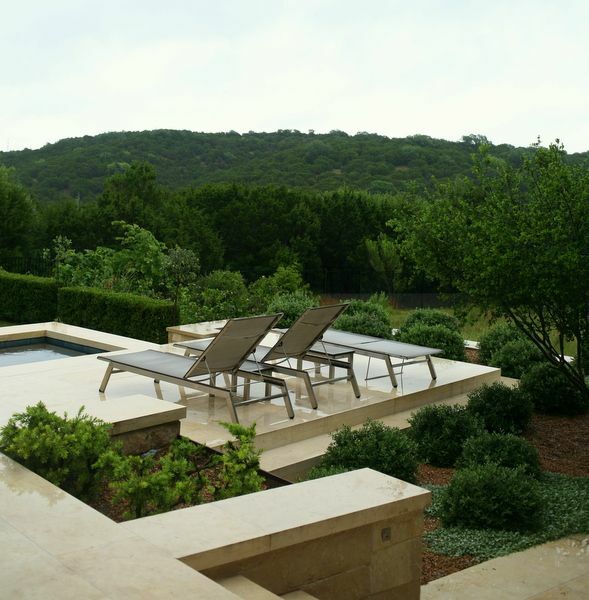 The view from the terraces also encompasses the surrounding landscape. 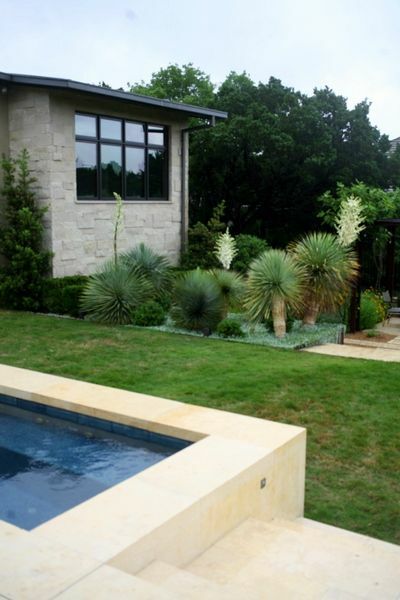 Yep, between the architect and the landscape architect, I don’t think they missed a trick. 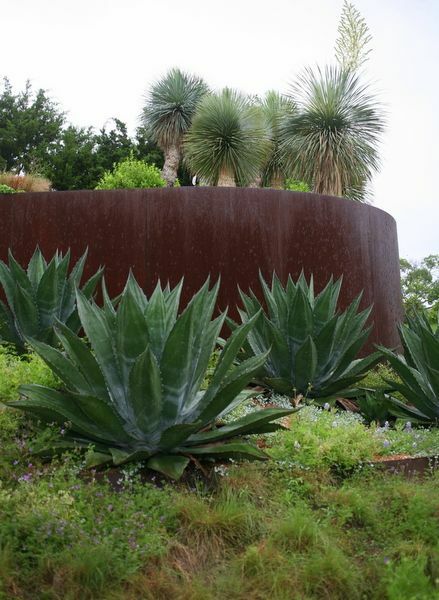 This entry was posted in agaves, woody lilies, artists, design, garden travel, garden visit and tagged Agave ovatifolia, Austin, COR-TEN steel, Curt Arnette, Garden Bloggers Fling 2018, LaRue Architects, Yucca rostrata. Bookmark the permalink. I’d say you got all the angles just right, Denise! 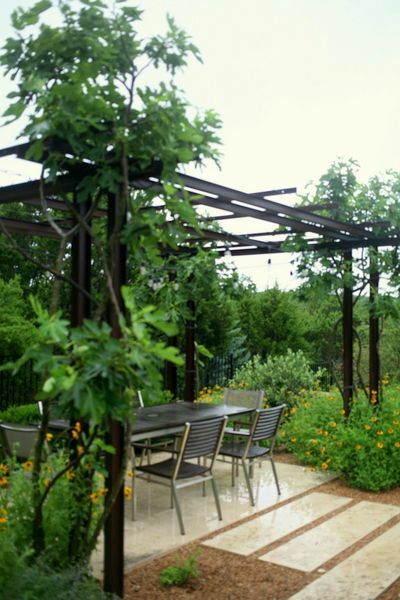 I don’t remember the outdoor dining table and the pergola above it at all. I’ll have to go back to my photos to see if I even picked that up. A serious omission if it utterly missed it as that’s one of my favorite views. Great post, and as I notice at almost each house I saw, I missed an entire part of the landscape. Here, the back and that pool! I completely agree with your take how the design team didn’t miss a beat or trick. Thanks for sharing. 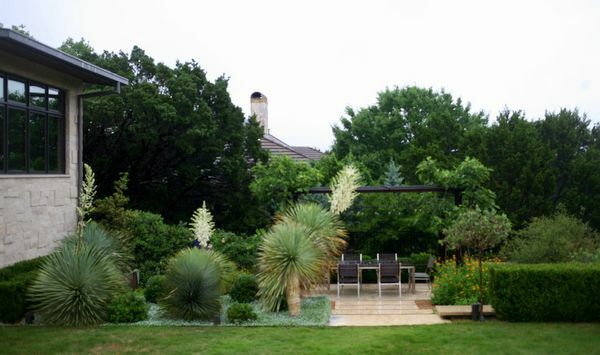 This garden is truly unique and wonderful, and I’ll be sure to share your post with both Curt Arnette and the owner, and maybe one of them can comment more on the design. 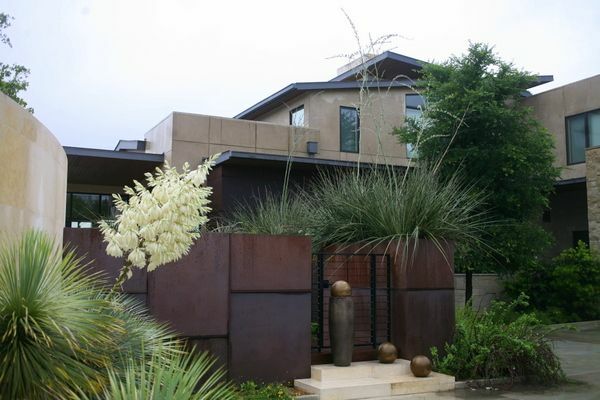 The Central Texas Gardener episode you linked to, however, shows a different Arnette-designed garden, not the Mirador project. So far as I know, CTG has never filmed the Mirador garden, but they should! Say what you will, I think your photos captured the garden beautifully. 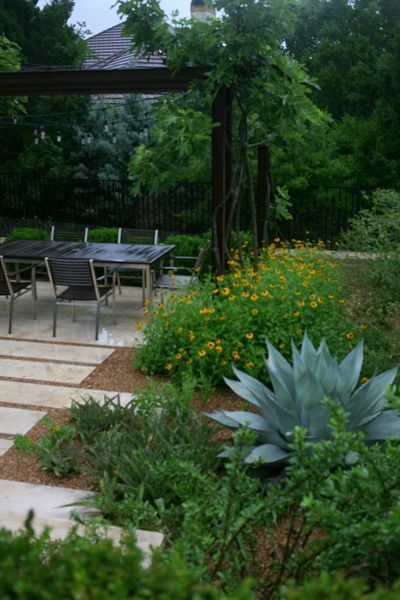 In order to understand and appreciate this garden I had to break it down into smaller elements. My world just doesn’t exist on this scale, it was hard to absorb. Not that I didn’t love it, I did. Very much. The house architect was Jim LaRue. We love the house and he was a joy to work with. And then Curt made the outside work the house. He’s a genius 🙂 It’s so fun to see what catches people’s attention…. and your photos, despite the rain, are beautiful! The plants, views, and architecture are all amazing. @Kris, that is so funny! I assumed I was missing a lot on this property because I didn’t have a lot of photos and obsessively took the same ones over and over! @David, it was a treat to see this property with you. I remember you were especially impressed with this one! @Pam, thanks so much for those corrections! @Loree, it definitely had some monumental qualities, especially that back entry! @Peter, it’s a wonderful project — so glad you enjoyed! Laurel, thank you so much for the info — and especially allowing us to see your home! I know your taste and contributions are equally responsible for its success. That’s fine, Nell — like Wikipedia, this blog is a group effort! Denise, you caught so much of the architectural and botanical beauty so quickly and despite the raindrops! So glad you got to see it in person! 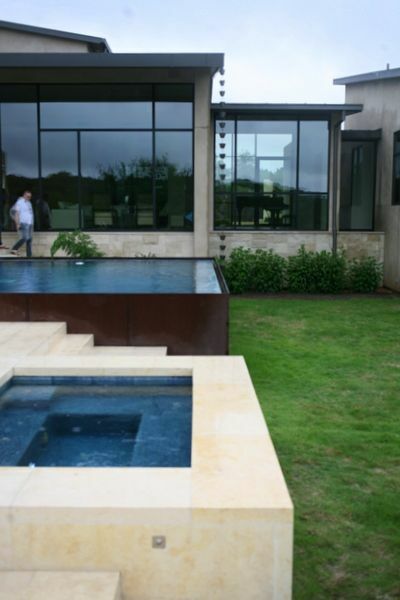 It was a spectacular house and landscape. I sure would like to see this garden lit up at night~It must be incredible. I so enjoyed this post and revisiting the garden. I thought these photos were wonderful. Somehow they gave me a different feeling about this garden which I thought was so austere. Reminds me that the view can depend on your point of view. I absolutely am going to try adn take more photos when I visit gardens.